Energy Modeling in Architectural Design demonstrates how design elements can lead to energy savings, to help you reduce the energy footprint of your buildings. In addition to identifying climate opportunities, you’ll also learn fundamental passive design elements for software-agnostic energy modeling of your projects from conception. Using parametric models and testing each element during design will lead you to create beautiful and high-performance buildings. Illustrated with more than 100 color images, this book also includes a pattern guide for high-performance buildings, discusses energy and daylighting optimization, and has a glossary for easy reference. List of Illustrations. Forward. Preface. Acknowledgments. Contributors. Chapter 1: Introduction. Chapter 2: An Overview of Energy Efficient Building Design. Chapter 3: Climate Opportunity. 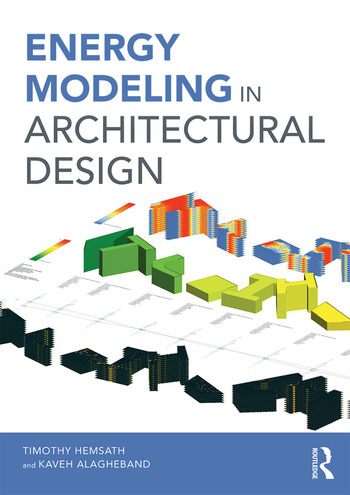 Chapter 4: Energy Modeling for Architects. Chapter 5: BEM Baseline. Chapter 6: Passive Solar BEM. Chapter 7: Issues with BEM. Chapter 8: Project Examples. Appendices. Glossary. Bibliography. Index. Timothy L. Hemsath is a registered architect and an associate professor of architecture at the University of Nebraska-Lincoln, USA; as well as sustainable design leader for HDR, Inc. in Omaha, USA. Kaveh Alagheh Bandhosseini is a doctoral candidate in architecture at the University of Nebraska-Lincoln, USA.